SpaceX’s Falcon 9 launch vehicle has enjoyed a successful maiden flight on Friday, carrying a prototype Dragon spacecraft into orbit. Launch – at 2:45pm Eastern – came near the end of a four hour launch window, which was interrupted by an issue with the Flight Termination System (FTS) – several incursions into the Range, and an abort at T-3 seconds during a 1:30pm Eastern attempt. Staging and second stage flight – despite some roll – appeared to be nominal. The payload for this launch is the Dragon Spacecraft Qualification Unit, which is a prototype Dragon spacecraft similar to the boilerplate Apollo spacecraft launched on Saturn I rockets in the mid 1960s. It was originally built as a ground test article, but was converted to a flight test article late last year. Its main objective is to allow the aerodynamics and performance of the rocket, whilst carrying a Dragon spacecraft, to be evaluated prior to the first launch of an operational Dragon spacecraft. Dragon is a spacecraft which SpaceX has been developing for NASA’s Commercial Orbital Transportation Services (COTS) programme, which is intended to allow for commercial resupply missions to the International Space Station following the retirement of the Space Shuttle. SpaceX and Rocketplane Kistler were awarded contracts to develop their proposals in 2006, however in 2007 the contract with Rocketplane Kistler was terminated, and a new contract was awarded to Orbital Sciences Corporation in 2008, which has led to the development of the Cygnus spacecraft that is expected to fly next year. In addition to the prototype on this launch, three Dragons will be launched on COTS demonstration missions, followed by up to twelve operational resupply missions under the Commercial Resupply Services contract, signed in late 2008. 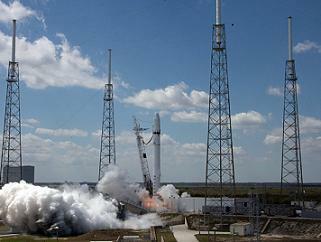 Two independent DragonLab scientific flights are also scheduled. Despite only being contracted for unmanned missions, the Dragon spacecraft was designed to be capable of manned flight, and SpaceX claims that a manned launch could be made with a lead time of approximately three years. Although the Dragon spacecraft is yet to fly, several components have been tested under flight conditions, and the DragonEye LIDAR sensor flew aboard STS-127. DragonEye is expected to be reflown on STS-133, and will subsequently be used on operational Dragon missions to determine the spacecraft’s distance from the ISS during rendezvous operations. The first Falcon 9 launch is the sixth overall flight for the Falcon family of rockets. The previous five flights have been made using the smaller Falcon 1, and have resulted in three failures and two successes. The first launch, in March 2006, failed shortly after liftoff due to a fuel leak caused by corrosion. A number of problems, including an incorrect first stage fuel ratio and second stage fuel slosh, prevented the second test flight from reaching orbit. The third launch failed after unexpected residual thrust in the first stage engines caused recontact during staging. Following these failures, two successful launches were conducted; the first in September 2008 with the RatSat demonstration payload, and the second in July 2009 with the RazakSat imaging satellite for ATSB of Malaysia. 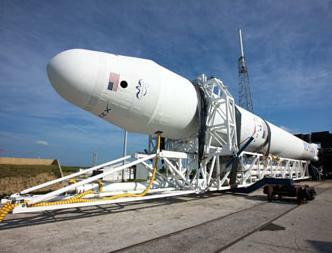 The Falcon 9 is a medium capacity partially reusable carrier rocket, which has been developed by SpaceX. It consists of two stages; both powered by Merlin engines burning RP-1 propellant in liquid oxygen oxidiser. The first stage, is powered by nine Merlin-1C engines, can generate 5 meganewtons (1.125 million pounds) of thrust at sea level. The second stage, which is powered by a single Merlin engine modified for optimum performance in a vacuum, can produce 445 kilonewtons (100,000 pounds) of thrust. Attitude control for both stages will be provided by thrust vectoring; with four Draco thrusters augmenting this after the first stage has separated. For this launch, the rocket will fly without a payload fairing. A regular Falcon 9, with a payload fairing rather than the exposed Dragon spacecraft, would stand 54.9 metres (180 feet) tall, with a diameter of 3.6 metres (12 feet). It has a mass of 333,400 kilograms (735,000 pounds), and according to SpaceX figures, it is capable of placing up to 10,450 kilograms (23,050 pounds) of payload into low Earth orbit, or up to 4,680 kilograms (10,320 pounds) into a geosynchronous transfer orbit. A proposed heavy-lift derivative, the Falcon 9 Heavy, would feature two additional first stages to be used as booster rockets, and would be able to place 32,000 kilograms (70,548 pounds) of payload into Low Earth orbit, or 19,500 kilograms (42,990 pounds) of payload into geosynchronous transfer orbit. The rocket and spacecraft arrived at Cape Canaveral early this year, and were integrated in the hangar before being rolled out to the launch pad on 19 February, and erected on 20 February. SpaceX then conducted a wet dress rehearsal, before attempting a static firing on 9 March. The first attempt at conducting the static firing was aborted two seconds before ignition after the ground isolation valve failed to open, preventing the first stage turbopumps from starting. The test was successfully completed four days later, with the engines firing for three and a half seconds. Since the static firing, the launch has been delayed several times due to issues with the qualification of the flight termination system, which is used by the Range Safety Officer to destroy the rocket in the event that it goes off course. 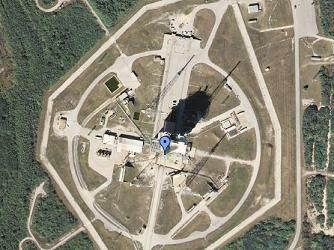 Falcon 1 launches have not required an active flight termination system as the requirements for launching from Omelek Island are less stringent than those for Cape Canaveral. The last time Range Safety destroyed a rocket launched from Cape Canaveral was the maiden flight of the Delta III, in August 1998, however such systems have been used elsewhere more recently. There is a forty percent chance that bad weather will prevent the launch tonight, with the main concerns being rain and anvil clouds. The launch window for tonight’s attempt will open at 15:00 GMT (11:00 local time), and close four hours later at 19:00 GMT (15:00 local). In the event of a scrub, a 24 hour delay is possible, using the same window on 5 June. About seventy five seconds into the flight, the rocket will pass through the area of maximum dynamic pressure, or max-Q. As the rocket ascends, and fuel is depleted, its acceleration will increase. Around 155 seconds into the launch, two engines will be shut down to reduce the acceleration, limiting loads on the vehicle. About three minutes into the flight, the remaining first stage engines will shut down, and five seconds later stage separation will occur, with pneumatic actuators pushing the first and second stages apart. Assuming that the first stage flight and separation are nominal, the second stage will ignite four seconds after separation to begin the first of two planned burns. This burn is expected to end after eight minutes and thirty seven seconds of flight. At this point, its engine will be shut down, and the spacecraft will probably separate shortly afterwards. The target orbit for the spacecraft after today’s launch is understood to have an altitude of approximately 250 kilometres (155 miles), and 34.5 degrees of inclination. After spacecraft separation, the rocket will continue to coast until fifty four minutes and thirty three seconds after launch. Once the coast phase is complete, the second stage is expected to restart and burn for around sixty eight seconds, a burn which it is understood is intended to place the upper stage into a heliocentric orbit, however this has not been officially confirmed, and some reports suggest SpaceX may have changed their plans and opted for a longer first burn instead. Following today’s launch, SpaceX plans to recover the first stage. This has been attempted before on the first three Falcon 1 launches, however it has not yet been successfully demonstrated; in two cases it was precluded by launch failures, and in the third it was unsuccessful. 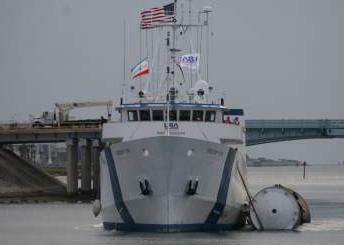 MV Freedom Star, the ship which will be used for the first stage recovery, departed Port Canaveral in the early hours of 24 May. Freedom Star, along with her sister ship MV Liberty Star, are operated by NASA, and are usually used to recover Solid Rocket Boosters after Space Shuttle launches. Freedom Star also recovered the first stage of the Ares I-X rocket after its launch last year. SpaceX have announced that they intend to evaluate the outcome of this launch based on how many test objectives are met, rather than on the performance of the rocket, or the orbit achieved. This could lead to the same confusion that occurred after the second Falcon 1 launch, when SpaceX claimed the launch had been successful despite it failing to achieve orbit. In retrospect, that launch is now generally seen as a failure. Today’s launch will take place from Space Launch Complex 40 at the Cape Canaveral Air Force Station. This is a former Titan launch complex, which was built in the 1960s to support the Titan IIIC, which made its maiden flight from the complex on 18 June 1965. The third launch from the complex, which occurred in November 1966, placed the OPS 0855 spacecraft, a mockup of the Manned Orbital Laboratory (MOL), into orbit. The Gemini spacecraft used for the Gemini II test mission was also relaunched on this flight, onto a suborbital trajectory. Three secondary Orbiting Vehicle payloads were also launched. Launch Complex 40 was to have been the primary East Coast launch site for MOL missions, and as a result underwent conversion to accommodate it. An environmental shelter was installed in the mobile service structure, and following the cancellation of MOL in 1969, this was converted for use with regular payloads. As a result of MOL requirements, no launches were made from LC-40 between 1967 and 1969. When it resumed operations in 1970, it became the primary East Coast Titan III launch complex, and the other complex, LC-41 was converted to accommodate NASA missions using the Titan IIIE. The last Titan IIIC was launched from LC-40 in 1982, followed shortly afterwards by the first Titan 34D; an interim rocket designed to launch heavy military payloads until the Space Shuttle was fully operational. Eight were launched from LC-40, including the maiden and final flights; another seven flew from Vandenberg. After the Titan 34D, LC-40 was next used by the Commercial Titan III, a short-lived variant of the Titan 34D designed to launch commercial spacecraft. The first launch of the Commercial Titan III occurred in the early hours of 1 January 1990 GMT, although due to US time zones being behind GMT it was still 31 December at the launch site. Four Commercial Titan IIIs were launched; the first carried two independent commercial communications satellites, the second and third each carried a single Intelsat communications satellite, and the fourth carried NASA’s Mars Observer spacecraft. The second flight placed Intelsat IV F3 into a lower-than-planned orbit, from which it was later reboosted by Space Shuttle Endeavour on its maiden flight, STS-49. Between the third and fourth Commercial Titan III launches, the complex was completely rebuilt, and from 1994 onwards it supported Titan IV launches. The Titan IVB made its maiden flight from the complex in 1997, and later that year the Cassini mission to Saturn was launched from the complex. The final Titan launch from the complex occurred on 30 April 2005, when the penultimate Titan IVB placed the USA-182, or Lacrosse-5, radar reconnaissance satellite into orbit. In April 2007, SpaceX signed a contract to lease the complex for Falcon 9 operations. Shortly afterwards work began to dismantle the launch tower. On 27 April 2008, the Mobile Service Structure was demolished in a controlled explosion. Work then began to construct Falcon 9 support equipment at the site. The pad was refurbished, and facilities for fuelling the rocket with liquid oxygen and RP-1 were added. In late 2008, the first Falcon 9 was delivered to the launch site for facility tests, and by early January 2009 it had been assembled. The launch mount and erector were subsequently assembled, and on 10 January, the rocket was erected on the pad. Once facility checks were complete, the rocket was disassembled and returned to the factory to be completed. By June 2009, a hangar for integrating the rockets and payloads had been constructed at the pad. The RP-1 tanking system had also been completed, and work on the liquid oxygen system was nearly complete. Two other launch sites for the Falcon 9 are under evaluation. These are Kwajalein Atoll, from where all five Falcon 1 launches have taken place, and Space Launch Complex 4E at the Vandenberg Air Force Base in California. Like Space Launch Complex 40, Space Launch Complex 4E was previously used by Titan rockets, specifically the Titan IIID, 34D and IV. It was also used by Atlas-Agena rockets. These launch sites will allow higher orbital inclinations to be reached than are possible from Canaveral; such orbits will be required by SAOCOM satellites which are scheduled for launch on Falcon 9 rockets in 2012 and 2013. According to SpaceX plans, another Falcon 9 launch will be made later this year, with the Dragon C1 spacecraft. This will be the first demonstration flight as part of the Commercial Orbital Transportation Services programme. If that is successful, the second demonstration mission will be launched in March next year.